Famously, the Egyptian pyramids were built to host the body of the king. They became temples to the dead, and a new source of worship. That’s all very nice—but perhaps a little elitist. That was the thought of Thomas Willson in 1829, when he proposed a new solution to London’s ongoing problem with graveyard overpopulation: a pyramid mausoleum which could contain the corpses of five million people, and which, if completed, would have been ninety-four floors high (by comparison, the Chrysler Building has just seventy-seven floors). And it would have been located in the middle of London. Willson thought the idea compact, hygienic, and ornamental, and he hoped that people would come from afar to have picnics and admire it. He also calculated that it would bring in a tidy profit of around ten million pounds. Not all envisaged the idea in the same way, however: one historian has described it as a “nightmarish combination of megalomaniacal Neo-Classicism and dehumanized Utilitarian efficiency”, which is an old-fashioned way of saying “this stinks.” In the end, public opinion turned against it—Londoners most likely deciding that they would rather picnic a park than beneath a colossal pyramid of death. We associate the Romans with amphitheaters, temples, and statues—but one thing we don’t tend to think of is pyramids. Well, think again. Smack-bang in the middle of Rome is a two-thousand-year-old, 121-foot (37m)-high pyramid. The Romans had only recently made Egypt a province, and were obviously impressed with their huge tombs to ancient kings. “I like the sound of that,” a Roman magistrate called Gaius Cestius probably said—and had one built for himself, Roman-style, upon his death. Alas, as with the Egyptian pyramids, advertising your tomb in such grand style isn’t always a good idea; both his body and the pyramid’s other contents were plundered in antiquity. What do you do when you want to build a sixty-five-floor pyramid in the middle of crowded Mexico City? Why, you turn it upside-down and build it underground, of course. That’s the proposal of a Mexican architectural firm. They want to give the city’s main square a glass floor, and build a pyramid of offices, homes, and shops underneath it. Mexico has a rich history of pyramid building from the Maya civilization, and according to one of the architects, the proposed pyramid would “dig down through the layers of cities to uncover our roots.” Because there’s nothing like building a vast, hi-tech underground shopping centre to discover your roots. At a projected $800 million, the city hasn’t yet expressed much enthusiasm for the idea. What’s the biggest pyramid in the world? The Great Pyramid of Giza? No—there’s actually one that’s twice as big. Though not as tall as the Great Pyramid of Egypt, the Great Pyramid of Cholula—which also has the less catchy name of Tlachihualtepetl—is much wider. It can be found in central-east Mexico, and was built over a period of a thousand years, from the third century B.C. to the ninth century A.D. Some say that it was built by a giant called Xelhua, but archaeologists, predictably, disagree. They claim that the pyramid was constructed by a series of ancient Mexican civilizations, who added layer upon layer over the years. These days it’s quite overgrown, and doing its best impression of a hill—so much so that the Spanish built a church on it in the sixteenth century. Everybody thinks of Egypt as the pyramid capital of the world, but there’s another country that has twice as many pyramids: Sudan. Located directly to the south of modern Egypt, they were mostly built around the third century B.C.—around eight hundred years after the last Egyptian pyramids were built. There are more than two hundred and fifty of them, ranging from twenty feet (6m) to one hundred and twenty feet (36m) high. Many of these have only been discovered in the last few years, suggesting that either the Sudanese were fantastic at hiding their pyramids, or that archaeologists prefer more glamorous locations in which carry out their digging. It may not be much to look at these days, but the mausoleum pyramid of the first Emperor of China is deadly. It was built from 246 B.C. to 208 B.C., supposedly by as many as 700,000 men—and it was filled with more traps than would fit into an Indiana Jones movie. It was supposed to be a representation of the Emperor’s palace and universe, and in this vein he had all his childless concubines killed and buried with him. Lovely. Workers, too, were buried alive, in order to preserve the pyramid’s secrets, and trees and grass were planted to make it seem like a hill. The Chinese are yet to excavate, claiming that archaeology isn’t sophisticated enough to do the job properly. But it could well be that they’re simply scared of the traps; for instance, it’s known that the pyramid was filled with a moat of mercury. More than two millennia later, mercury readings from the site are still dangerously high. Being an architect is tough work. You spend months getting your drawings and measurements perfect—only to have the builders read your plans the wrong way round. That looks like what happened in 1983, for the construction of the 262-foot (80m)-high Slovak Radio Building, in Bratislava, Slovakia. Inside is a concert hall—and it proudly boasts one of the largest organs in Slovakia. If you’re visiting in a group, make sure everyone is spread around evenly; it looks like it could topple at any moment. Sure, it didn’t last long—but for a while, New York had its own pyramid. At the end of World War One, thousands of helmets from captured German soldiers were taken back to America, and in a somewhat macabre victory display, they were piled up into a pyramid at Grand Central Terminal. Somehow, we don’t think this would be received very well today. Still, it’s a touch more civilized than the similar actions of fourteenth-century Central Asian emperor Tamerlane. During one siege, he built a pyramid of 90,000 human skulls in front of a besieged city to intimidate them. We imagine that it worked. Pyramids of death don’t die that easily. In 2007, a group of German entrepreneurs unveiled their designs for a 1900-foot (580m)-tall pyramid to house the bodies of up to forty million dead people. It would also be multi-colored, as if to compensate for the fact that it would be filled with dead bodies. For around $1000, anybody could sign up to have their ashes encased in a block after they die—and the color would be of their choosing. At around ten times the size of the original Great Pyramid, it would have almost literally cast a shadow over the neighboring villages. Remarkably, the group were given $115,000 of funding from the German government to pursue the idea; since then, however, the plan seems to have faded due to lack of interest and local objection to having a gigantic multi-colored pyramid full of dead people on their doorstep. But don’t worry: if you’re interested, you can still sign up here. Why restrict pyramid building to our own planet? The Curiosity rover sent by NASA to examine Mars found something rather curious. This pyramid looks like it’s been copied from the ancient Egyptian ones—or perhaps it’s the other way round. NASA scientists say that the pyramid is most likely the product of wind erosion; but in the minds of ancient aliens theorists, it’s “hard evidence” that our world today has been shaped by mystical space aliens from Mars. 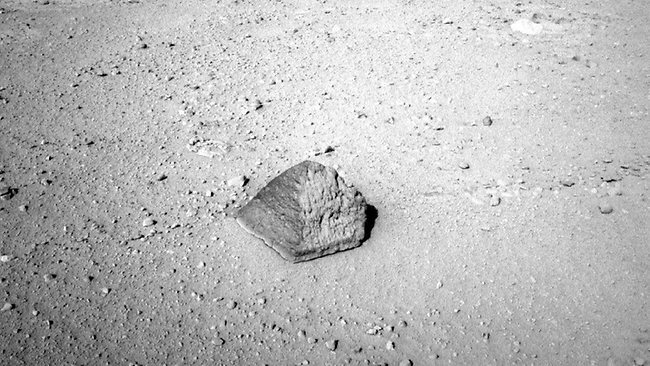 One thing is for sure, however: if the aliens who built this rock were the ones who visited Earth, they must have been pretty tiny. The Pyramid of Mars is about the same size as a football.